If one is not supporting the Syrian government, it is very clear they are supporting Al Qaeda. So obvious is this fact, that the Western press and the corporate-financier think tanks that produce for them their talking points, have begun a campaign to re-brand Al Qaeda as a lesser evil vis-a-vis ISIS. In reality, there is virtually no difference, with the US and its regional allies clearly arming, funding, and supporting both. Members of al Qaeda’s branch in Syria have a surprising advocate in the corridors of American power: retired Army general and former CIA Director David Petraeus. The former commander of U.S. forces in Iraq and Afghanistan has been quietly urging U.S. officials to consider using so-called moderate members of al Qaeda’s Nusra Front to fight ISIS in Syria, four sources familiar with the conversations, including one person who spoke to Petraeus directly, told The Daily Beast. Within this rhetorical shift we find an admission that there is indeed no “moderate rebel” force to speak of. All that exists, admittedly, are extremists operating under the various banners of Al Qaeda and ISIS. Revelations of America’s support behind Al Qaeda may not have ever been so overt, but are certainly nothing new. It is admitted that the US and its Saudi allies first created Al Qaeda as a proxy mercenary force to fight the Soviet Union in a proxy war in Afghanistan in the 1980s. In 2007, long before the current war in Syria broke out, it was warned by Pulitzer Prize winning journalist Seymour Hersh in the pages of the New Yorker that under the then Bush administration, support already began to flow to the Muslim Brotherhood in Syria and other extremists groups including Al Qaeda for the purpose of violently undermining the Syrian government in Damascus. Past and present, it is clear that Al Qaeda was and still is a central instrument of the United States in achieving geopolitical objectives – particularly where Western forces cannot immediately or in any practical sense intervene directly. But Al Qaeda and its various affiliates are only one faction among many terrorist groups minding the vast interests of American global hegemony. A recent bombing in the heart of Bangkok, capital of Southeast Asia’s nation of Thailand, and ongoing violence in China’s Xinjiang region expose another vast network of US-sponsored terrorism operating in tandem with Al Qaeda and in fact stretching from Asia all the way to frontiers of America’s proxy war with Syria. In the late 1970s, armed bands of Gray Wolves launched a wave of bomb attacks and shootings that killed hundreds of people, including public officials, journalists, students, lawyers, labor organizers, left-wing activists and ethnic Kurds. During this period, the Gray Wolves operated with encouragement and protection of the Counter-Guerrilla Organization, a section of the Turkish Army’s Special Warfare Department. Working out of the U.S. Military Aid Mission building in Ankara, the Special Warfare Department received funds and training from U.S. advisors to establish “stay behind” squads of civilian irregulars who were set up to engage in acts of sabotage and resistance in the event of a Soviet invasion. Similar Cold War counter-guerrilla units were created in every member state of the North Atlantic Treaty Organization. But instead of preparing for foreign enemies, these operatives often set their sights on domestic targets. At the height of the Cold War, the army used the Gray Wolves as a violent counterweight to Turkish Communists. The party’s coffers swelled with secret contributions from the government. By the late 1970s, the Gray Wolves had spun out of state control. Their paramilitary wing fought a campaign against leftist rivals that killed nearly 6,000 people. Ali Agca, who shot Pope John Paul II in a 1981 assassination attempt, is alleged to have been affiliated with the party. The article would also reveal that despite this horrific past, the Grey Wolves and their political allies were still a very potent political force in Turkey. Today, the Grey Wolves function as a paramilitary wing of the Nationalist Movement Party (MHP), which holds the third largest number of seats in Turkey’s parliament. As troubling as this should be to Turks who may find themselves on the receiving end of a politically powerful terrorist organization apparently tolerated, even sponsored by NATO for decades and in particular, supported by the United States, the Grey Wolves’ terrorism has branched out far beyond Turkey’s borders. Enter the Grey Wolves, one of the world’s most notorious terrorist organizations. Founded in the 1960s, the Wolves are a pan-Turkic paramilitary group with 1 million followers across the Near East, Central Asia and inside Xinjiang. During the decade of political violence in Turkey in the 1980s, the military-backed activists launched a wave of assassinations, massacres of ethnic minorities, and extortions of businesses. By official count, the Turkish government holds the Wolves responsible for more than 600 murders, while leftists estimate the victims numbered in the many thousands. Following the collapse of the Soviet Union, the Grey Wolves set up training camps in Central Asia for youths from Turkic language groups, including Uighur. Their indoctrination program embraces the goal of establishing Turan, a Turkish empire across Euro-Asia, subjugating non-Turkish races and unleashing violence to achieve their ends. Out of the limelight, the Wolves provided commando training and material support for the East Turkestan Independence Movement. In essence, NATO’s stay-behind networks had become NATO’s “go-abroad” networks, projecting the same sort of violence, terrorism, and political coercion abroad after the Cold War that these networks carried out domestically during the Cold War. 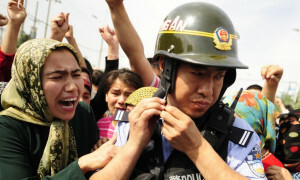 The alleged “struggle” by the Uyghur people in Xinjiang, referred to by the terrorists and their foreign sponsors as “East Turkistan,” consists of two essential components – a foreign harbored political front including the Washington D.C. and Munich-based World Uyghur Congress (WUC) and a militant front clearly backed by the US and NATO through intermediary groups like Turkey’s Grey Wolves. The WUC declares a nonviolent and peaceful opposition movement against Chinese occupation of East Turkestan and an unconditional adherence to the international accepted human rights standard as laid down in the Universal Declaration of Human Rights, and adherence to the principals of democratic pluralism and rejection of totalitarianism, religious intolerance, and terrorism as an instrument of policy. And while WUC claims to stand for a “peaceful opposition” to resist what it calls “Chinese occupation,” it regularly justifies, defends, or covers up violence. Perhaps the most appalling example of this was when it failed to condemn the 2014 brutal murder of prominent Uyghur imam, 74 year old Jume Tahir, in front of China’s biggest and oldest mosque. WUC would denounce him as a “tool” of the Chinese government and even go as far as denounce China for sentencing his killers – Uyghur terrorists – to death for the horrific murder. Clearly WUC not only finds it impossible to denounce terrorism, it willfully serves as rhetorical cover for it. Because the American effort to ‘integrate’ China into the liberal international order has now generated new threats to U.S. primacy in Asia—and could result in a consequential challenge to American power globally—Washington needs a new grand strategy toward China that centers on balancing the rise of Chinese power rather than continuing to assist its ascendancy. Encouraging separatism in China’s western Xinjiang region, if successful, would carve off a substantial amount of territory. In conjunction with US-backed separatism in China’s Tibet region, an immense buffer region stands to be created that would virtually isolate China from Central Asia. And while the Grey Wolves and their Uyghur proxies are working hard to create this barrier to China’s west, with their involvement in a recent bombing in Bangkok, it appears the US is now using them to augment efforts to create a similar encirclement across Southeast Asia. The Turkish-Uyghur terror network, in addition to fomenting violence across China, has more recently been trafficking terrorists from Xinjiang, through Southeast Asia, and onward to Turkey where they are staged, armed, trained, and then sent to fight NATO’s proxy war in Syria. This trafficking network apparently snaked its way through Thailand – exposed when Thailand detained over 100 Uyghurs which it then deported upon Beijing’s request back to China in July. On the same day the deportations occurred WUC and NATO’s Grey Wolves organized violent protests in Turkey both in Ankara and at the Thai consulate in Istanbul during which the consulate was invaded and destroyed. A month later, a devastating bomb would detonate in the heart of Bangkok, killing 20 mostly Chinese tourists and injuring over 100 more. In addition to the BBC already being on site before the blast, the British network would conclude even before bodies were cleared from the site that Uyghurs were likely behind the blast. This was done specifically to deflect blame from another US proxy, Thaksin Shinawatra, who has been attempting for years to regain power in Thailand. In reality, Shinawatra and the Uyghur terrorists are both functions of the same Westesrn agenda to encircle and contain China by building up a “wall” of proxy states around Beijing, and if nothing else, to create chaos in which Beijing finds it nearly impossible to prosper. 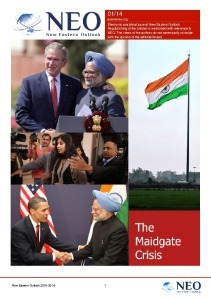 What is perhaps most concerning regarding these two Western proxies is the fact that many past bombings associated with Shinawatra’s terrorist networks – networks which are extensive – match the methods used by Turkish-Uyghur terrorists making it likely that NATO’s extraterritorial networks New American Media reported on in 2009 being set up in China, are likely now dotting Uyghur trafficking routes throughout Southeast Asia as well. The blast in Bangkok likely took place for a number of reasons. Not only did Thailand ignore US demands to release the detained Uyghurs to Turkey, as well as oust a long-cultivated US proxy – Thaksin Shinawatra – but it has been cultivating unmistakably closer ties to Beijing including the signing of major joint-infrastructure development projects, closer military cooperation, and even the potential procurement of 3 Chinese-made submarines – all of which US policymakers have been decrying with increasing indignation. And while the US is using Turkish-Uyghur terror to extort concessions from Southeast Asia and to destabilize China, it is likely that this “other Al Qaeda” will turn up still in other regions – most predictably, Russian Crimea. Crimea rejoined Russia after a NATO-backed, violent Neo-Nazi coup overthrew the government of Ukraine, creating a cascade of anti-Russian violence across the country. Eager to avoid the fate of many cities across Ukraine, the people of Crimea overwhelmingly voted in a referendum to rejoin Russia. Since then, Crimea has enjoyed peace and prosperity just across the border from a Ukraine now mired in civil war and economic catastrophe, all compounded by an illegitimate regime beholden to the US and NATO who thrust it into power. The fact that the border between Russian Crimea and Ukraine also represents the border between peace and pandemonium highlights the criminal chaos fostered by US-NATO meddling in Ukraine. A peaceful, stable Crimea serves as a constant reminder to all in Eastern Europe that where ever NATO goes, chaos follows. If the US and its NATO allies could destabilize Crimea, thus creating chaos within newly repatriated Russian territory, the West could make a compelling case that dealing with Russia is at least as undesirable as dealing with NATO. US-NATO backed Turkish terrorism would be the key to accomplishing this. 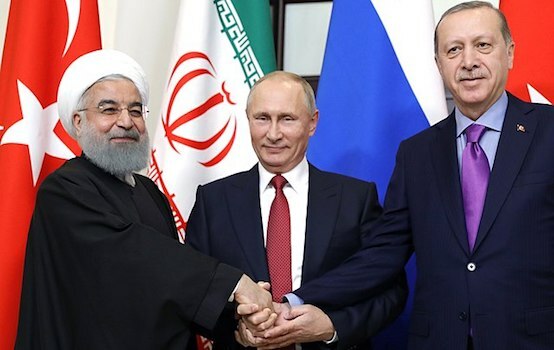 Crimea’s proximity to Turkey and a sizable Turkish Tatar minority serves as a potential medium for the West to carry this out. Already the Western media has invested heavily in a narrative centered around “disenfranchised Tatars” and has begun working with opposition groups to stir up confrontations. Like in Xinjiang, those willing to participate in such an opposition constitute a fractional minority – but through the power of Western media, are inflated in the minds of impressionable audiences. Putin suggested that foreign countries were funding rights activists in an effort to “destabilize the situation” by playing up problems faced by Crimean Tatars, the third-largest ethnic group after Russians and Ukrainians on the peninsula, and said that Moscow would not allow this. Understanding the scope of Turkish-Uyghur terrorism, their rhetorical supporters, and the function both serve toward maintaining US global hegemony helps disarm the West of its various volatile narratives and criminal conspiracies aimed at creating and leveraging terrorism. If when each bomb goes off, or when any consulate is attacked, the public points the finger not at America’s proxies, but directly at the special interests upon Wall Street and lining Washington instead, all benefits of carrying out a proxy campaign of global terrorism to begin with will evaporate before the West. As is already happening in Syria where Western plans have been frustrated by growing global awareness of the West’s true involvement in the conflict and its role behind groups like Al Qaeda and ISIS, by exposing their “other Al Qaeda,” their plans elsewhere around the globe will likewise be confounded. And while the US has attempted for years to galvanize the world behind its global agenda through the use of terrorism, it is ironic that now China, Russia, and even nations like Thailand all now find themselves on common ground, having reason to cooperate closer together in facing a common threat – America’s global terror enterprise.